Morse code is a method for transmitting telegraphic information, using standardized sequences of short and long elements to represent the letters, numerals, punctuation and special characters of a message. The short and long elements can be formed by sounds, marks, or pulses, in on off keying and are commonly known as "dots" and "dashes" or "dits" and "dahs." Morse code can be transmitted in a number of ways: originally as electrical pulses along a telegraph wire, but also as an audio tone, a radio signal with short and long tones, or as a mechanical or visual signal (for example, a flashing light) using devices like an Aldis lamp or a heliograph. Morse code is transmitted using just two states (on and off) so it was an early form of a digital code. However, it is technically not binary, as the pause lengths are required to decode the information. Originally created for Samuel F. B. Morse's electric telegraph in the early 1840s, Morse code was also extensively used for early radio communication beginning in the 1890s. For the first half of the twentieth century, the majority of high-speed international communication was conducted in Morse code, using telegraph lines, undersea cables, and radio circuits. However, the variable length of the Morse characters made it hard to adapt to automated circuits, so for most electronic communication it has been replaced by more machinable formats, such as Baudot code and ASCII. Use of Morse code revolutionized international communication. Ability to use a visual signal also meant that Morse code could be used to indicate distress and the need for assistance, whether from a life-boat at sea or from an isolated land location (signalling a searching rescue aircraft). Over the years, Morse has been used in inter-governmental communication, in commerce, in times of distress, it has helped to make war but also peace. Its use is increasingly a matter of historical interest but few would dispute that it has made a contribution to human communication of incalculable value and significance. Beginning in 1836, Samuel F. B. Morse and Alfred Vail developed an electric telegraph, which used electrical currents to control an electromagnet that was located at the receiving end of the telegraph wire. The technology available at the time made it impossible to print characters in a readable form, so the inventors had to devise an alternate means of communication. Beginning in 1837, William Cooke and Charles Wheatstone operated electric telegraphs in England, which also controlled electromagnets in the receivers; however, their systems used needle pointers that rotated to indicate the alphabetic characters being sent. In contrast, Morse and Vail's initial telegraph, which first went into operation in 1844, made indentations on a paper tape when an electrical current was transmitted. Morse's original telegraph receiver used a mechanical clockwork to move a paper tape. When an electrical current was received, an electromagnet engaged an armature that pushed a stylus onto the moving paper tape, making an indentation on the tape. When the current was interrupted, the electromagnet retracted the stylus, and that portion of the moving tape remained unmarked. The Morse code was developed so that operators could translate the indentations marked on the paper tape into text messages. In his earliest code, Morse had planned to only transmit numerals, and use a dictionary to look up each word according to the number which had been sent. However, the code was soon expanded to include letters and special characters, so it could be used more generally. The shorter marks were called "dots," and the longer ones "dashes," and the letters most commonly used in the English language were assigned the shortest sequences. In the original Morse telegraphs, the receiver's armature made a clicking noise as it moved into and out of position to mark the tape. Operators soon learned to translate the clicks directly into dots and dashes, making it unnecessary to use the paper tape. When Morse code was adapted to radio, the dots and dashes were sent as short and long pulses. It was later found that people become more proficient at receiving Morse code when it is taught as a language that is heard, instead of one read from a page. To reflect the sound of Morse code, practitioners began to vocalize a dash as "dah," and a dot as "dit." Morse code was an integral part of international aviation. Commercial and military pilots were required to be familiar with it, both for use with early communications systems and identification of navigational beacons which transmitted continuous three letter ID's in Morse code. As late as the 1990s, aeronautical charts listed the three letter ID of each airport in Morse and sectionals still show the Morse signals for Vortac and NDB used for in flight navigation. Morse code was also used as an international standard for maritime communication until 1999, when it was replaced by the Global Maritime Distress Safety System. When the French navy ceased using Morse code in 1997, the final message transmitted was "Calling all. This is our last cry before our eternal silence." The most popular current use of Morse code is by amateur radio operators, although it is no longer a requirement for Amateur licensing in some countries. It also continues to be used for specialized purposes, including identification of navigational radio beacon and land mobile transmitters, plus some military communication, including flashing-light semaphore communications between ships in some naval services. Morse code is the only digital modulation mode designed to be easily read by humans without a computer, making it appropriate for sending automated digital data in voice channels, as well as making it ideal for emergency signaling, such as by way of improvised energy sources that can be easily "keyed" such as by supplying and removing electric power (e.g. by flipping a switch or turning a flashlight on and off). These six elements serve as the basis for International Morse code and therefore can be applied to the use of Morse code world-wide. Morse code has been in use for more than 160 years — longer than any other electronic encoding system. What is called Morse code today is actually somewhat different from what was originally developed by Vail and Morse. The Modern International Morse code, or continental code, was created by Friedrich Clemens Gerke in 1848 and initially used for telegraphy between Hamburg and Cuxhaven in Germany. After some minor changes, in 1865 it was standardized at the International Telegraphy congress in Paris (1865), and later made the norm by the International Telecommunication Union (ITU) as International Morse code. Morse's original code specification, largely limited to use in the United States, became known as American Morse code or "railroad code." American Morse is now very rarely used except in historical re-enactments. International Morse code today is most popular among amateur radio operators, where it is used as the pattern to key a transmitter on and off in the radio communications mode commonly referred to as "continuous wave" or "CW." The original amateur radio operators used Morse code exclusively, as voice-capable radio transmitters did not become commonly available until around 1920. Until 2003 the International Telecommunication Union (ITU) mandated Morse code proficiency as part of the amateur radio licensing procedure worldwide. However, the World Radiocommunication Conference of 2003 (WRC-03) made the Morse code requirement for amateur radio licensing optional. Many countries subsequently removed the Morse requirement from their license requirements. Until 1991, a demonstration of the ability to send and receive Morse code at five words per minute (WPM) was required to receive an amateur radio license for use in the United States from the Federal Communications Commission. Demonstration of this ability was still required for the privilege to use the HF bands. Until 2000, proficiency at the 20 WPM level was required to receive the highest level of amateur license (Extra Class); effective April 15, 2000, the FCC reduced the Extra Class requirement to 5 WPM. Finally, effective February 23, 2007, the FCC eliminated the Morse code proficiency requirements for all amateur licenses. While phone (voice) and data transmissions are limited to specific amateur radio bands, CW is the only form of communication that is permitted on all amateur bands—LF, MF, HF, UHF, and VHF. In some countries, certain portions of the amateur radio bands are reserved for transmission of Morse code signals only. Because Morse transmissions employ an on-off keyed radio signal, it requires less complex equipment than other forms of radio communication. Morse code also requires less bandwidth than voice communication, typically 100-150 Hz, compared to the roughly 2400 Hz used by single-sideband voice. Morse code is received as a high-pitched audio tone, so transmissions are easier to copy than voice through the noise on congested frequencies, and it can be used in very high noise / low signal environments. The fact that the transmitted energy is concentrated into a very limited bandwidth makes it possible to use narrow receiver filters, which suppress or eliminate interference on nearby frequencies. The narrow signal bandwidth also takes advantage of the natural aural selectivity of the human brain, further enhancing weak signal readability. This efficiency makes CW extremely useful for DX (distance) transmissions, as well as for low-power transmissions (commonly called "QRP operators," from the Q-code for "reduce power"). There are several amateur clubs that require solid high speed copy, the highest of these has a standard of 60 WPM. For a slower level, the American Radio Relay League offers a code proficiency certification program that starts at 10 WPM. The relatively limited speed at which Morse code can be sent led to the development of an extensive number of abbreviations to speed communication. These include prosigns and Q codes, plus a restricted standardized format for typical messages. This use of abbreviations also facilitates communication between operators who do not share a common language and thus would have great difficulty in communicating using voice modes. 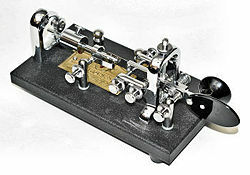 Although the traditional telegraph key (straight key) is still used by many amateurs, the use of semi- and fully-automatic electronic keyers (known as "bugs") is prevalent today. Computer software is also frequently employed to produce and decode Morse code radio signals. Operators skilled in Morse code can often understand ("copy") code in their heads at rates in excess of 40 WPM. International contests in code copying are still occasionally held. In July 1939 at a contest in Asheville in the United States Ted R. McElroy set a still-standing record for Morse copying, 75.2 WPM. In his online book on high speed sending, William Pierpont Nohff notes some operators may have passed 100 WPM. By this time they are "hearing" phrases and sentences rather than words. The fastest speed ever sent by a straight key was achieved in 1942 by Harry Turner W9YZE (d. 1992) who reached 35 WPM in a demonstration at a U.S. Army base. As of 2007 commercial radiotelegraph licenses are still being issued in the United States by the Federal Communications Commission. Designed for shipboard and coast station operators, they are awarded to applicants who pass written examinations on advanced radio theory and show 20 WPM code proficiency [this requirement is waived for "old" (20 WPM) Extra Class licensees]. However, since 1999 the use of satellite and very high frequency maritime communications systems (GMDSS) have essentially made them obsolete. Radio navigation aids such as VORs and NDBs for aeronautical use broadcast identifying information in the form of Morse Code. Before using such aids, a pilot listens to the Morse code identification to ensure he or she is tuned to the proper aid. In speed contests between expert Morse code operators and expert cellphone SMS text messaging users, Morse code has consistently won, leading to speculation that cellphone manufacturers might someday build interfaces for Morse code input. This interface would translate the Morse code input into text, so that it could be sent to any SMS-capable cellphone, thus the recipient would not need to know Morse code in order to read it. (There are third party applications already available for some cellphones that allow Morse code input for sending SMS (see external links)). Other speculated applications include taking an existing assistive application of Morse code and using the vibrating alert feature on the cellphone to translate SMS messages to Morse code for silent, hands free "reading" of the incoming messages. Many Nokia cellphones have an option to beep either "SMS" or "CONNECTING PEOPLE" in Morse code as an audible alert for the reception of a text message. Morse code has been employed as an assistive technology, helping people with a variety of disabilities to communicate. Morse can be sent by persons with severe motion disabilities, as long as they have some minimal motor control. In some cases this means alternately blowing into and sucking on a plastic tube ("puff and sip" interface). People with severe motion disabilities in addition to sensory disabilities (e.g. people who are also deaf or blind) can receive Morse through a skin buzzer. Products are available that allow a computer operating system to be controlled by Morse code, allowing the user access to the Internet and electronic mail. In one case reported in the radio amateur magazine QST an old shipboard radio operator who had a stroke and lost the ability to speak or write was able to communicate with his physician (a radio amateur) by blinking his eyes in Morse. A better confirmed case occurred in 1966 when American prisoner of war Jeremiah Denton, brought on television by his North Vietnamese captors, Morse-blinked the word TORTURE. Morse messages are generally transmitted by a hand-operated device such as a telegraph key, so there are variations introduced by the skill of the sender and receiver—more experienced operators can send and receive at faster speeds. There are two "symbols" used to represent letters, called dots and dashes or (more commonly among CW users) dits and dahs. The length of the dit determines the speed at which the message is sent, and is used as the timing reference. 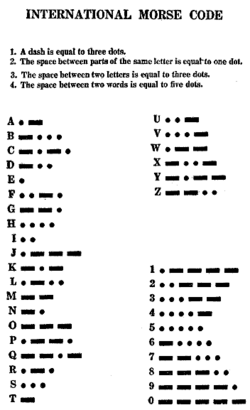 The speed of Morse code is typically specified in "words per minute" (WPM). In text-book, full-speed Morse, a dah is conventionally 3 times as long as a dit. The spacing between dits and dahs within a character is the length of one dit; between letters in a word it is the length of a dah (3 dits); and between words it is 7 dits. The Paris standard defines the speed of Morse transmission as the dot and dash timing needed to send the word "Paris" a given number of times per minute. The word Paris is used because it is precisely 50 "dits" based on the text book timing. Where: W is the desired speed in words-per-minute, and T is one dit-time in milliseconds. People learning Morse code using the Farnsworth method, named for Donald R. "Russ" Farnsworth, also known by his call sign, W6TTB, are taught to send and receive letters and other symbols at their full target speed, that is with normal relative timing of the dots, dashes and spaces within each symbol for that speed. However, initially exaggerated spaces between symbols and words are used, to give "thinking time" to make the sound "shape" of the letters and symbols easier to learn. The spacing can then be reduced with practice and familiarity. Another popular teaching method is the Koch method, named after German psychologist Ludwig Koch, which uses the full target speed from the outset, but begins with just two characters. Once strings containing those two characters can be copied with 90 percent accuracy, an additional character is added, and so on until the full character set is mastered. Note that there is little point in learning to read written Morse as above; rather, the sounds of all of the letters and symbols need to be learned, for both sending and receiving. There is no standard representation for the exclamation mark (! ), although the KW digraph (— · — · — —) was proposed in the 1980s by the Heathkit Company (a vendor of assembly kits for amateur radio equipment). While Morse code translation software prefers this version, on-air use is not yet universal as some amateur radio operators in Canada and the USA continue to prefer the older MN digraph (— — — ·) carried over from American landline telegraphy code. The &, $ and the _ sign are not defined inside the ITU recommendation on morse code. But the $ sign code was defined inside the Phillips Code (huge collection of abbreviations used on land line telegraphy) as a SX representation. The above given representation for the &-sign is the morse pro sign used for wait. 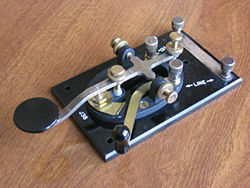 On May 24, 2004—the 160th anniversary of the first public Morse telegraph transmission—the Radiocommunication Bureau of the International Telecommunication Union (ITU-R) formally added the "@" ("commercial at" or "commat") character to the official Morse character set, using the sequence denoted by the AC digraph (· — — · — ·). This sequence was reportedly chosen to represent "A[T] C[OMMERCIAL]" or the letter "a" inside the swirl appearing to be a "C". The new character facilitates sending electronic mail addresses by Morse code and is notable since it is the first official addition to the Morse set of characters since World War I. Defined in the ITU recommendation. See Other alphabets in Morse code. For Chinese, Chinese telegraph code is used to map Chinese characters to four-digit codes and send these digits out using standard Morse code. Some methods of teaching or learning morse code use the dichotomic search table below. A graphical representation of the dichotomic search table: the user branches left at every dit and right at every dah until the character is finished. Morse code has been used many times in music, print advertising, artwork, and as a plot device in films, television, and novels. The theme music of the television series Some Mothers Do 'Ave 'Em, composed by Ronnie Hazlehurst, spells out the programme's title in Morse code. ↑ "Learn Morse Code," AARL Web Learn Morse Code Retrieved December 7, 2007. ↑ "Morse Code" Morse Code Retrieved September 6, 2011. ↑ "Article 22," the International Amateur Radio League Article 22 Retrieved December 7, 2007. ↑ "FCC Adopts Notice of Proposed Rulemaking, Proposing to Eliminate ALL Morse Test Requirements!" FCC Adopts Notice of Proposed Rulemaking, Proposing to Eliminate ALL Morse Test Requirements! Retrieved December 7, 2007. ↑ "Italy Joins No-Code Ranks as FCC Revives Morse Debate in the US" AARL, August 10 2005Italy Joins No-Code Ranks as FCC Revives Morse Debate in the US Retrieved December 7, 2007. ↑ Biennial Regulatory Review—Amendment of Part 97 of the Commission's Amateur Service Rules. Federal Communications Commission, FCC 99-412 Retrieved December 7, 2007. ↑ William G. Pierpont Nohff. The Art and Skill of Radio-Telegraphy, 3rd ed. The Art and Skill of Radio-Telegraphy Retrieved December 7, 2007. ↑ Neal McEwen, "A Tribute to Morse Telegraphy and Resource for Wire and Wireless Telegraph Key Collectors and Historians," The Telegraph Office A tribute to More Telegraphy Retrieved December 7, 2007. ↑ "Morse Code for Computer Access," Makoa.orgMorse Code for Computer Access Retrieved December 7, 2007. ↑ International Morse Code Gets a New ITU Home, New Character," ARRL International Morse Code Gets a New ITU Home, New Character Retrieved December 14, 2007. All links retrieved October 23, 2018. This page was last modified on 23 October 2018, at 23:26.